BOSTON, MA -- Another week has come to a close in the Eastern Hockey League Premier (EHLP), as we are now less than a month away from the postseason. This past weekend featured 12 of the 13 EHLP teams in action, with a number of intriguing matchups. As always, with plenty of great games there were a number of worthy candidates for our weekly honors. 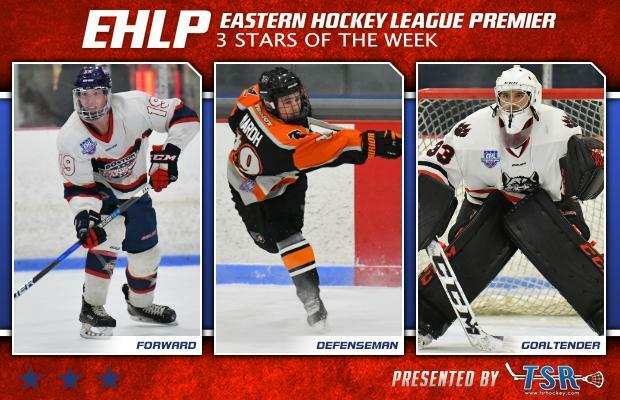 The EHLP is pleased to announce that Kyle Welch (Boston Jr. Rangers), Eric Maard (Philadelphia Little Flyers), and Hunter Koch (New England Wolves) have been named the TSR Hockey Stars of the Week. This upcoming week includes 15 more games from Wednesday to Tuesday. The next set of TSR Hockey Stars of the Week will be released on Tuesday, February 20th at 4:00pm. Catch the EHLP action all season long on HockeyTV. Welch and the Rangers won both of their games this past weekend against Central Penn Panthers, as the '99 led the way on Saturday with a hat trick and an assist in the 10-1 victory. The native of Swampscott, MA continued to find the scoresheet on Sunday tallying three more points, giving him a total of five goals and two assists (seven points) for the weekend. The forward has now tallied 18 goals along with 13 assists in just 18 games for the Rangers this year. Welch and the Rangers will gear up for a big weekend coming up with a trio of home games against the Vermont Lumberjacks. Maard and the Little Flyers won both of their games this past weekend against the New York Applecore. The '99 defensemen led the way from the blue line on Saturday with a goal and three assists in the 8-0 shutout win. Maard added another goal in his team’s win the very next day as well, giving him a total of five points for the weekend. The native of Sweden, leads all defensemen on his team in the assist category with 18 on the year and has collected 27 total points to his name. The Little Flyers are set to get back to work this week with a pair of games in Massachusetts against the Walpole Express. Koch was between the pipes for the Wolves only game this past week, as the '99 came up big in net stopping 26 shots in a 5-2 win against the Vermont Lumberjacks. The native of New Jersey has now recored seven wins for the Wolves this season, which is the most on the team. The regular season is coming to a close for Koch and the Wolves with just three games remaining, starting with a matchup on the road this upcoming Friday against the Walpole Express. 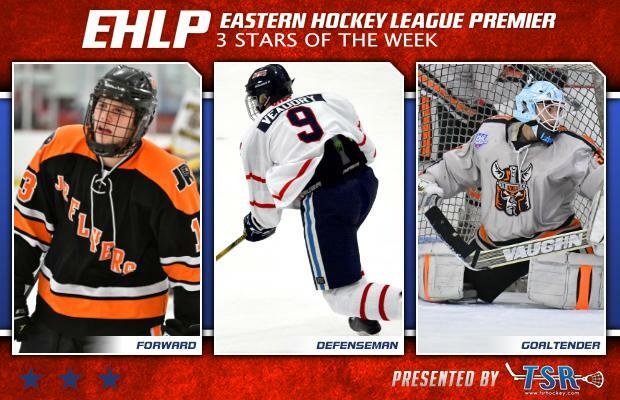 The EHLP would also like to recognize a trio of honorable mentions this week starting with Austin Mazzulo of the Philadelphia Little Flyers. The '99 recored a hat-trick in just the 1st period in his team’s win against the New York Applecore on Sunday, along with a pair of assists. Jon Fowler of the Boston Jr. Rangers also had a hat-trick on Sunday, with the '99 netting his against the Central Penn Panthers. Tim Rye had a big week for the Rangers as well, recording four goals and four assists to his name.